While the government has been touting the Goods and Services Tax as a path-breaking measure, there are those who believe that the tax reform will be bad for both the consumers and the economy. Madhukar Narayan Hiregange, chairman, indirect tax committee, Institute of Chartered Accountants of India, believes that GST is the way to go, and explains to Rediff.com's Syed Firdaus Ashraf why the new tax is imperative for India's economic success. You have been quoted as saying that after GST kicks in, 70 per cent of commodities will become cheaper. What makes you believe so? There are many reasons why the cost of goods can come down. Earlier, various taxes had to be paid and they could not be adjusted against future taxes. Say, a service provider buys gadgets like television, refrigerator, laptop, photocopy machine and also stationery items. He had to pay VAT (Value Added Tax) on each of these items. And on this VAT he could not get any credit against his service tax liability. Even the trader had to take services from various sources -- transportation, insurance, annual maintenance contract as well as handling equipment for storage requirements -- and he had to pay excise or service. He too did not get credit for that. The third type of activity where people lost money was during inter-state sales where they were charged two per cent central sales tax and this CST was not there in the state. Thus, if he had to transfer his goods to another state he had to set up a warehouse there as it was a customer driven need. Whenever he did this and transferred his goods to another state, he had to move it as stock transfer and at that time the local credit which he had earned in terms of VAT, had to be reversed. That would be between 2 and 5 per cent normally. Moreover, when goods were being transported, say, from Bengaluru to Haryana, the travel time was almost five days. Now, post-GST, since there will not be any check-post to collect octroi, travel time will come down to three days. Thus, logistics cost is expected to come down by 15 per cent under GST. The other things that will save time are forms. You had Form C, Form H (to clear goods) and most of these were misused. All these forms, issued by statutory authorities, were a big problem for large companies who were tax compliant. Even today they have not got forms for the year 2015 and now we are in 2017. Whenever I sell something inter-state, I am charged 2 per cent fee against Form C.
As these forms will now cease to exist, we will naturally save plenty of time and transportation cost. Corruption in the indirect tax department (under the VAT regime) was phenomenal. Now under GST, since everything is automated, the incidence of meeting tax officers will be only 10 per cent of what it was earlier. When corruption comes down money is naturally saved. Earlier, the fence ate the crops. The I-T sleuths, in the name of collecting taxes, actually filled their own pockets through bribes. Ask any businessman to name a few honest tax officers in his city, he won't be able to name more than two or three people. These 'costs', too, will not be there in future. It sounds good, but my friend went to buy furniture and found that the price has increased post-GST. Even Surat textile traders are protesting against GST. Unfortunately in India, the grey market is huge. Here every transaction is in cash and no record whatsoever is ever kept. The wood is purchased in cash, furniture is sold in cash, procurement is in cash and earlier, traders in such a 'cash markets' did not pay any tax. 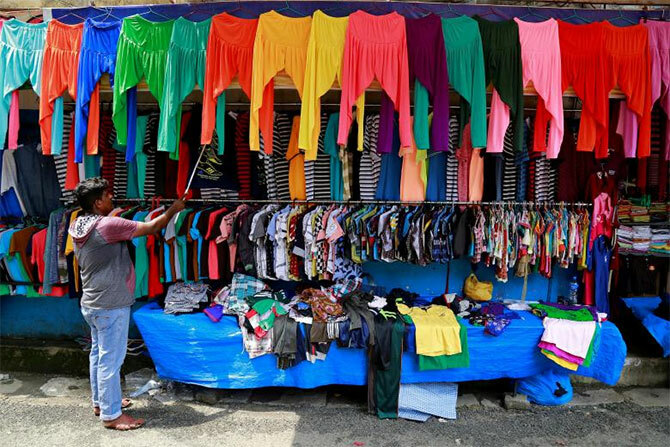 For traders in the Surat textile markets, everything is in cash from the beginning till the end. Since these traders did not pay any tax, they could afford to keep the prices low. But no such luck now. GST will ensure that he pays the right tax. As a matter of fact, now he will be tracked as early as when he buys his raw material. Prior to GST, excise duty on furniture was 12.5 per cent and VAT was 14.5 per cent. But since 'cash market' traders did not pay any tax, the prices of unbranded goods were less. So the days of 'cash market' dealings are over? No, it is not over, but it will be difficult for them to survive. The government has put various stringent laws to curb the grey economy, which is substantial. In textiles they have put 5 per cent tax on goods worth less than Rs 10,000. But traders are reluctant to comply with it. If you want to understand business in India, then you must know that large chunks of businesses are run by uneducated and unorganised people. It does not mean they are bad. They are good in their trade, but they are not true professionals. Now, they are feeling that their business is under threat. Some people say GST should not have been introduced so soon after demonetisation. It is done one by one. Benami property was the first to be targeted. The second target was contractors who were minting money, but not showing it on paper. These people were in the grey economy earlier and now they have no choice. Products sold by these people will naturally become costlier. On the other hand, those who are tax compliant will reap plenty of benefits, specially while competing with the unorganised sector. So GST is very good for our country. GST is very good for our country and for the tax-compliant. These people who were evading taxes for years were actually allowed to flourish by the government. The commercial tax department was so corrupt that for the post of an officer, people did not deter to pay even Rs 1 crore. All these things, possibly, will cease to exist. Is it true that businessmen will have to file 37 income tax returns in a year, as is being widely perceived? The maximum number of assesses are traders in India. There will be, I guess, 80 lakh dealers or traders. If I was a trader in Madhya Pradesh, I will still be in Madhya Pradesh under GST. As a trader in Madhya Pradesh, I used to file one return per month. Now also I will have to file one return per month. But now the tax has been broken into Madhya Pradesh GST and Central GST. But return is only one. If I am selling inter-state, then I will have to charge a combination of these two taxes. In the returns there will be a break-up. In the first part of the return the seller will have to upload all his sales. The moment he uploads the details, they will automatically reflect in the records of the person with whom he is conducting his business (say, Mr X). The cumbersome part is that Mr X will now have to check if all his invoices are reflecting in the electronic register or not. If all is fine, then he just has to say okay. Don't you think this is like a police State where everything is being watched real time by government officers? But people were evading taxes. Fake bills were created and now with GST it will not be possible. It is a cumbersome process and I don't know if small traders will be able to comply with it. I too have questions in my mind. There can be some problems and small traders need to be educated. Has GST succeeded in any country? I believe there are some 145 countries who have implemented GST. Yes, there are 145 countries with GST. GST is imperative for India's success. In India, we are 40 years late for GST. In between we introduced tax reforms in parts like in excise we had MODVAT in 1987. Service tax came in 1994 and in 2005 it was VAT. This particular method of partially bringing tax credit into the system had hardly helped India. Without GST, India will be a less competitive country.